Thanks for the input guys. Has anyone tried the savory blend from Charcuterie with smashed garlic and peppercorns? I am pumped about that one. Smelled great going into the bag. Could you please post that recipe? Or could you post the maple cure? I have my AMS smoker on order along with the Charcuterie book from Amazon . . . but neither have arrived yet. Figured I can start the cure now . . just need to know how, thanks! My last batch was the maple cure, but I add crushed peppercorns. No garlic. This hybrid was very good. When we tried the brown sugar hickory and the regular hickory only from the butcher, we liked the regular better. I think my first will be little to no sugar, pepper, and that's about it. Maybe I try one apple and one hickory if I do two smoke sessions. The maple was 2 tsp pink salt, 1/4 cup kosher salt, 1/4 brown sugar. Stir until blended. Then stir in 1/4 cup of maple syrup. Great . . . . I appreciate it. Ok confused about pink salt. I bought a few things of what I thought was pink salt, but thinking I made a mistake as mine is "himalania pink salt". 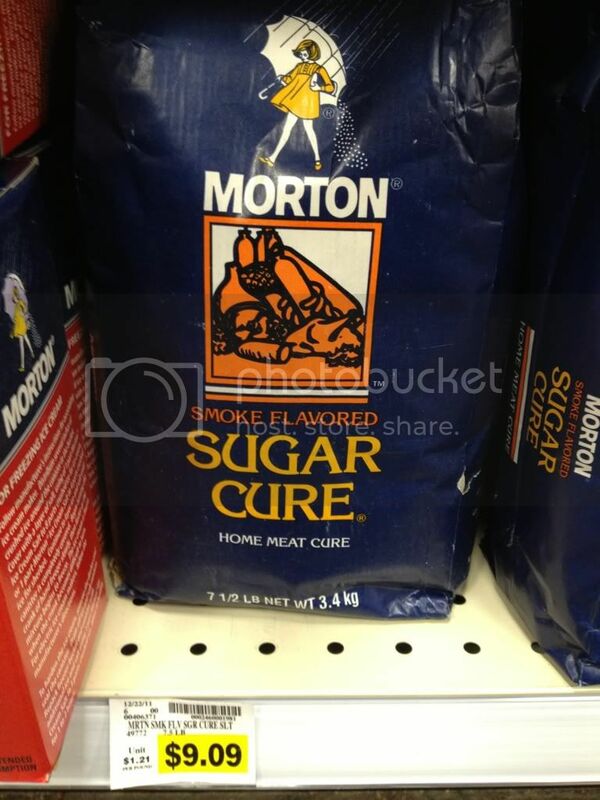 For bacon cure, do I need to order special nitrate pink salt fom some online store? Hate to break the news, but .... Yep. Mine arrived today. Also ordered my A-maze-n check out my other post for a discount coupon for them. Williams Sonoma sells it if you're by one of those. I found this to be the best price. @billyray holy cow I got ripped! Oh well live and learn. They get you on the shipping a little. $10 to SC for me. Ah then my amazon prime deal was not so bad. Ok, nitrite/nitrate talk in charcuterie kinda freaked me out, lots of warnings . . .but I only had time to skim hopng to start my first cure, but I will re-read later. Hey MQ, Focker, Nola, billyray, CT and whoever else that cures their own bacon-- how firm is it when it is ready? Mine has been going since last Sunday. Was kind of hoping to pull today, rinse and leave in fridge to form pellicle. Then smoke tomorrow? I know you can't rush chemistry, but what is the difference in 1 day of cure? I have to work Monday so smoking then will be a late night. Thought? It's hard to say how firm it ends up. If it feels a lot more firm from where you started you're good. I would think you're ok now at 6 days...unless its an especially thick piece of belly 6 days is usually good for me. I always just rinse off cure thoroughly....never soaked, but I've never felt like my bacon was too salty. I always measure out the proper amount of cure for the weight of bellies I have...never do the saltbox dredge method Ruhlman talks about in the book. Thanks MQ. Appreciate the confirmation. You could slice a piece from that side, and cook. If it turns gray, it is undercured. Regardless of size, I cure for 14 days. Max you can cure is 20 days. Then I soak for 2-3 hours, changing the water as needed. Fat distribution varies with each piece, some may never firm up. An extra week takes the guesswork out of things. Curing then equalizing is better than undercuring. I agree with MQ. When doing a sample piece to determine the saltiness, remember the first cuts off of either side are going to taste more salty. Same way after you smoke that the first cuts will taste more smoky.